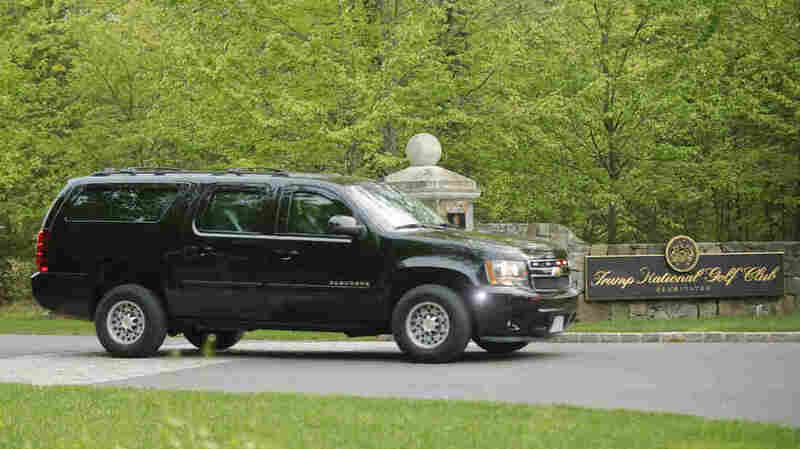 Trump's Third Home Away From Home To Cost Taxpayers Millions : The Two-Way Bedminster, the New Jersey town that President Trump often visits, has been designated an official presidential residence and will receive $41 million in federal funds to help cover security costs. Riding in a motorcade, President Trump leaves the Trump National Golf Club in Bedminster, N.J., earlier this year. The township is home to Trump National Golf Club Bedminster, one of Trump's favorite retreats. His daughter Ivanka Trump and Jared Kushner were married there, and Trump summoned advisers there for post-election transition planning. With the official designation as a presidential residence, Congress appropriated up to $41 million to cover security costs incurred between the Jan. 20 inauguration and Oct. 1, which starts a new fiscal year. Trump's residences in Florida and New York already get such funding. The costs are incurred by state, county and township law enforcement officers when Trump comes to town, as he did this month for the U.S. Women's Open golf tournament.